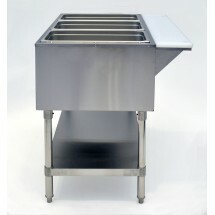 An indispensable addition to any buffet or catered event, the Atosa CSTEB-4 4 Well Electric Steam Table keeps all your culinary creations piping hot and readily available. 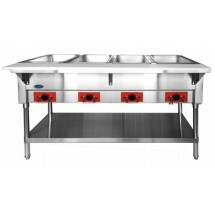 This premium quality steam table is made from 18-gauge stainless steel that provides unparalleled durability and longevity perfect for heavy duty, commercial use. 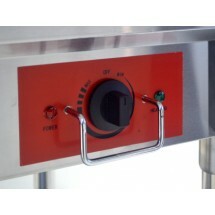 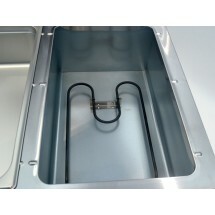 Featuring die-stamped openings with raised lips, loading and unloading food pans are quick and easy. 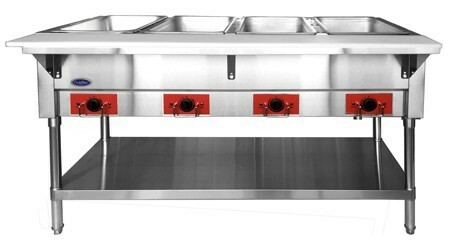 Each 8-inch well is fully insulated, independently controlled by an infinite control knob, and has an indicator light that shows power on and element heating. 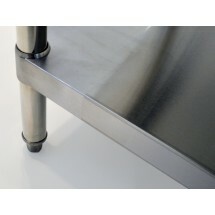 Dimensions: 58" x 29 1/2" x 33 1/2"